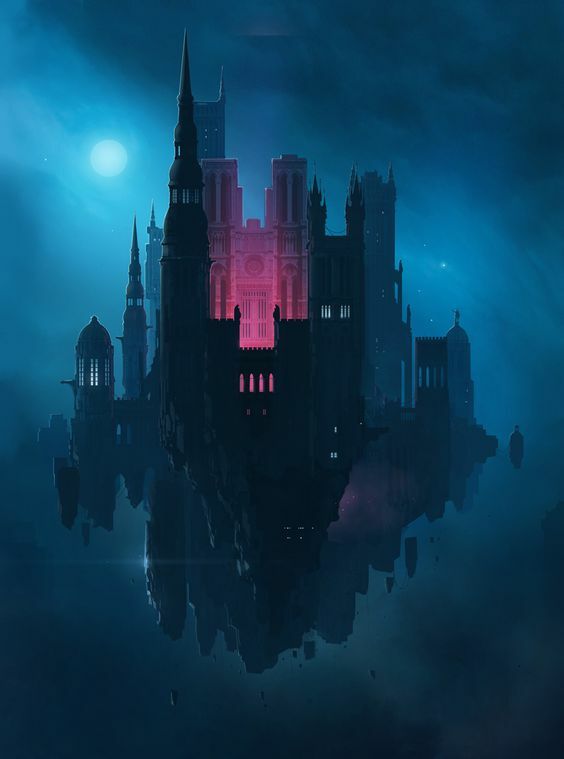 Once upon a time, the gods created a fabulous floating castle, built of gleaming marble and darkest obsidian. Here they housed their most powerful relics and artifacts hidden from the mortal world. To guard this precious warehouse, the gods chose a champion named Peshcheour (PESH-ur) to protect the castle endlessly. He willing swore a pact with the gods: Neither he nor his descendants would ever remove the artifacts from the castle or reveal the nature of the secrets held within its walls to any other being or beast, lest a terrible curse befall his line forever. As long as the pact remained intact, anyone honoring it would have eternal life. Peshcheour gathered to his cause other champions of the gods, who became paladins after swearing the same oath to the gods to protect the castle and its contents. With such mighty folk at his side, Peshcheour was well satisfied that the castle would be safe. He took a wife from among their number, and together they began a dynasty of guardians who remained the defenders of the castle for three centuries until greed wrought the downfall of Peshcheour’s dynasty. Legend had it that twin brothers were born to Peshcheour named Garlond and Alain. Garlond, the firstborn, tilled the soil, and his brother Alain was a shepherd. The brothers made their pacts to the gods, each becoming a sworn paladin. But when it came time for Garlond to take his turn upon the throne of the castle, Peshcheour favored Alain instead crowning him king. Anger brewed within Garlond until finally he entered the storage room and outfitted himself with the finest of godly relics, taking them as his own. He stalked to the throneroom of the castle, slaying his fellow paladins as he went, finally murdering Alain and mortally wounding Peshcheour. Garlond departed the castle, breaking the his oath and the pact, thus bringing eternal doom to his family. From that day, the floating citadel was called CASTLE ADIKOS. Now, the mysterious floating castle has appeared off of the shores of the Dark Continent called Chult. Many believe that it is the legendary CASTLE ADIKOS and that it may still contain many of the artifacts and relics sacred to the gods. A powerful wizard has sent out a call for heroes willing to risk their lives to mount an expedition to the citadel.